To develop trading systems first you need a trading concept. There are hundreds, if not thousands, of trading ideas. While you may think this is a key part of your system, based on the book by Van K Tharp "Trade you Way to Financial Freedom" it only accounts for about 10% of your success. The weekly stock of Glamis Gold (GLG) illustrates the system that we will be using as an example. This is only an idea. You need to determine if it is worth trading. Idea: If a stock makes a new weekly low but, closes above last week's close, closes above the open and closes in the top 75% of its weekly trading range is this a buy signal? Let's think about the idea. 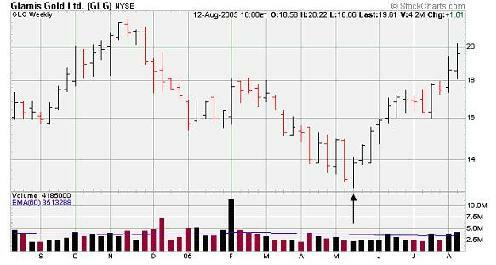 The stock hit a new low during the week of May 16, 2005 (shown by the arrow in the chart below). This is a bearish signal. However, also in that same week the stock closed higher. This is a bullish sign. If it was so weak, why did it close higher? Is it under valued? Is there a fundamental change going on? Our initial trading systems will be based on this idea. Now we need to figure out when to buy. Some examples are: we could buy at the Monday open, on Monday but at Friday's close, sometime in the future if the stock trades above the high seen during the week of May 16 or we could put in a low bid of say $13.50. Let’s buy on Monday but at Friday's close of $13.88. We place a buy stop on Monday and get filled at the low of the day (very lucky here). How many shares of GLG are we going to buy? Well, during the week of May 16, the low was $12.82. The difference between $13.88 and $12.82 is $1.06, which means if you set your sell stop just below $12.82, say $12.79, you will risk $1.09 per share. Therefore, if we buy 100 shares we are risking $109 plus commission. Using basic money management ideas, for a $10,000 account and 1.5% risk tolerance, you would buy 100 shares. In the above case, you won the bet and could have made around 40% if you targeted an exit price of $20. 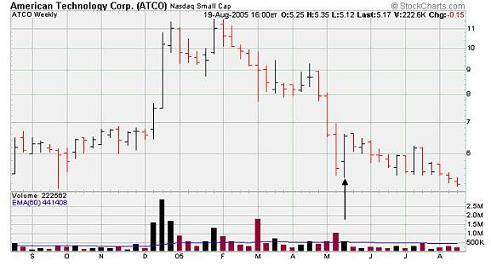 Before you get too excited, during the same week, American Technology Corp. (ATCO) also made a new low and closed higher as is shown by the arrow in the chart below. Unfortunately, in this trade you would have lost. This is why money management skills are so important. This is why when you trade you need to know your exit strategy. In summary, building trading systems is relatively easy if you can identify an idea that has the potential to offer you a profitable trade. In order to come up with trading ideas to build trading systems you may want to keep up with the market news by reading magazines which discuss the stock market.